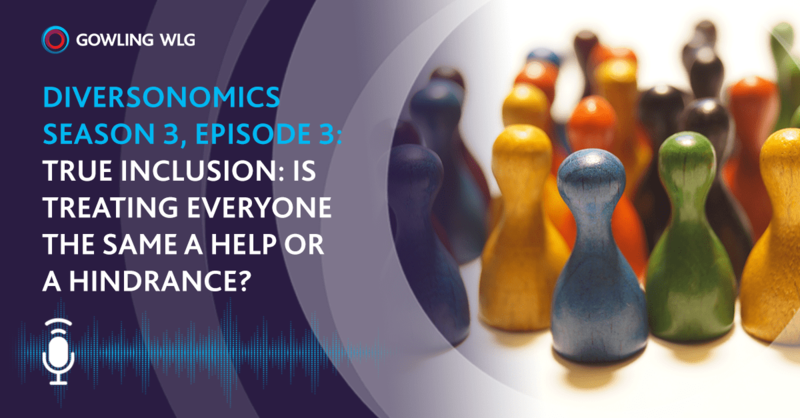 Diversonomics Season 3 | Episode 3 - True inclusion: Is treating everyone the same a help or a hindrance? What is true inclusion? We all have a general understanding of what it means to us, subjectively - but does treating people how we want to be treated actually equate to being inclusive? The answer may surprise you. Take a listen as our co-hosts Roberto Aburto and Sarah Willis talk to Michael Bach, founder of the Canadian Centre for Diversity and Inclusion, about how law firms and other organizations can objectively work on creating a more inclusive work culture. You are listening to "Diversonomics", a Gowling WLG podcast. Sarah: Welcome. Welcome. This is Season 3 of Diversonomics. The podcast about diversity and inclusion from Gowling WLG. I'm your co-host, Sarah. I practice in commercial litigation in the Ottawa office. Roberto: Also from Ottawa I'm your co-host Roberto Aburto. So pleased to welcome a very special guest today, Mr. Michael Bach. Michael is the founder of the Canadian Centre for Diversity and Inclusion. CCDI's focus is on practical sustainable solutions that help employers move toward true inclusion. The goal is to help each organization to be inclusive, free of prejudice and discrimination and to generate awareness and dialogue around D&I. So it seems like very simple goals that are very, no challenges, whatsoever. Sarah: Michael, himself, is nationally and internationally recognized as a thought leader and subject matter expert in the fields of diversity, inclusion and employment equity. Over the course of his career he's been recognized on numerous occasions for his work. For example, he was named as one of the Women of Influences 2012 Canadian Diversity Champion. In 2011 he was honoured as Diversity Champion with the catalyst Canada Honours Human Resources/Diversity Leader Award. And he's also received a number of other awards over the years including LGBTQ Person of the Year and the 2011 Out on Bay Street Leaders to be Proud of LGBT Advocate Workplace Award. Just to name a few. Suffice it to say he's incredibly accomplished in making us look extremely bad right now. Welcome, Michael. Michael: Hi. Thanks for having me. Sarah: Thank you for coming. Tell us a little bit about your past to diversity and inclusion, generally. Michael: I started my journey, to what is now my career, a very long time ago. In fact I was about 19 years old and I was the executive director of the Lesbian and Gay Youth of Toronto. Really, if you go back even further, I came out as gay at 16 and my parents had always raised me to believe that I had a right and responsibility to use my voice to create an inclusive world for people that didn't necessarily have a voice. But that wasn't a job you got paid for. I did all these things as volunteer work with different organizations throughout the years. Specifically in the LGBTQ space as well as women's organizations and newcomer organizations. Jump to 2005 when I was working the IT consulting practice at KPMG and I had the opportunity to get involved in what became a Pride at KPMG, the employee resource group for the LGBTQ population in the firm. All of a sudden the CEO knew my name and it started to become very clear that what was once a volunteer job is now actually a paying job. I went to the head of HR and said, "You know, if we're serious about diversity then we need full time resources and I want the job." So they sent me away to go and write a business case for the creation of a role and the next thing I knew I was leading diversity for KPMG. I subsequently went on and did 2½ years as the Deputy Chief Diversity Officer for KPMG International and then back into Canada before starting CCDI, where I am now the CEO. Sarah: Fantastic. Tell me a little bit about CCDI and sort of what you've been doing there and how you got started there. Michael: When I came back into the Canadian firm around 2010 I'd had the opportunity to kind of have a 30,000 foot view of diversity and inclusion in Canada and really felt like there was something missing. I felt like there was a need for an organization that would just wrap it's arms around the conversation in Canada. It's a big country. We are the second largest physical country in the world, however, we have a dramatically small population in comparison to some other countries. Just to put it in perspective, the United Kingdom would fit inside Canada 42 times. And yet they have double our population. That makes it very challenging when you're talking about diversity and inclusion in Vancouver or when you're talking about it in St. Johns. I started to doodle things on the back of napkins and the next thing I knew we were talking with employers about the idea. The idea is that we are, for lack of a better term, a center of excellence in diversity and inclusion in Canada. Very specific focus on Canada. We generally don't talk much about diversity and inclusion outside of our own country. We are an education charity. Our mandate is to educate Canadians on the value of diversity and inclusion. We do that in a number of means by putting on over 80 webinars a year, in person events in 18 cities across the country and 9 conferences. Not to mention we do a whole bunch of research, create tool kits and really try to put out information but most importantly we're here for employers. When they're looking for something we say, "Give us a call and we will redirect you in the right direction." As opposed to Googling. I love Google. They're a great company but when it comes to D&I I discourage the Google because you inevitably end up with things that aren't necessarily what you're looking for. Roberto: As we talked with CCDI a little bit, we talked about the concept of true inclusion. What do you think's meant by true inclusion? Michael: That's an interesting question, Roberto. What is true inclusion? Well, it's a very subjective thing. A person will determine what inclusion means to them as opposed to we, as a society, determining what it means to everyone. We have a general understanding of inclusion but I think we need to even go further to focus on treating people how they need to be treated as opposed to treating people how we think they need to be treated. But it's a very subjective thing. Roberto: It is a complicated concept, I guess, and with CCDI being at the forefront of D&I in Canada, what are some of the major barriers to true inclusion in the Canadian workplaces. Michael: I think it really comes down to one major barrier. I shouldn't say that. There's lot of barriers. But there's one major barrier that I've been really looking at and that is self-interest. There's self-interest in multiple ways. There's self-interest on the part of employers who, for example, find it inefficient to treat people differently therefore they default to treating everyone the same. There's self-interest on the part of individuals who, for example, are only able to view the world through their own personal lens as opposed to thinking about others. Give you an example of that, I am, as I mentioned, I'm an openly gay man. There could be, in my work, could be just focused on the inclusion of LGBT people as opposed to focusing on the inclusion of all people. If you are a racialized person we tend to group everyone into one bucket but the experiences of, say, an East Asian person who was born and raised in Canada, are very different from the experiences of a person who, say, was born and raised in Jamaica and now calls Canada home. Self-interest is big barrier. Of course there's things like unconscious bias, empathy and lack of awareness around these things. But I think ultimately it really comes back to that self-interest conversation. Roberto: I think there's been certainly some progress in the corporate front although we don't move quickly. We are moving, I think, in the right direction in a lot of circumstances. What are some of the things Canadian employers are doing right? Michael: I think we're talking about the conversation. That's the first thing we're doing right. I think we see this, now more than ever, a lot of employers are talking about this. We have 175 employer partners, not to mention a number of clients we work with in our consulting arm, and that list just keeps growing. So more and more employers are talking about this and not employers that feel that they have to do this from a compliance perspective. Because these are employers that don't have that compliance mandate. But employers that are saying, "You know what? If we don't focus on this then we're going to fall short. We're going to lose out on talent. We're going to lose out on clients." That's very much the first thing. I think some employers are doing a better job than others in terms of focusing on their recruiting processes, making sure that they're barrier free. I know that, in fact it just came out, a competitor of Gowling has announced that they're going to go to a résumé blind, name blind hiring, as part of their recruitment process for students. So, some organizations are really being progressive about this. Some are not. That's fine. That's just the reality. I think the education piece is critical and you see some employers who are doing a lot of training and development with their people on things like unconscious bias, on cultural confidence, on making sure that their people know how to deal with difference. I was just talking with a couple of retailers recently about the importance of cultural confidence in the retail sector. On not making decisions based on assumptions and stereotypes about the way a customer looks and how that can positively impact their organizations. I'm pleased to see this law firm that is doing this blind hiring initiative. I'd be very interested to see how it works out. I think trying different things is important. Testing them out. Seeing what works, what doesn't. Because, of course, every employer is different. It's not fair for me to sit here and talk about the good work of, say, TD Bank. They're doing some fantastic things. They're also a multinational organization with 80,000 employees and diversity team of 15. So, that's not necessarily something that I would say to a Gowling, "Oh, you should be doing this because TD is doing it." It's very individual based on industry size and geography. Roberto: It's certainly a journey. From my experience as far as sitting on our national council for the last 4 years and we've just brought on our first diversity and inclusion full-time manager which we're super excited and as soon as we'll get a chance to hear from him in a future episode. But there's certainly a lot going on in the market. Michael: Yeah. Which is great. That's a big thing, Roberto. It cannot be discounted the need for resources on this and we, sort of, beat this drum quite a bit. This is a job. A specialty. It requires a certain amount of education and it's important that we move this from off the corner of someone's desk to part-time and full-time roles where there is dedication to it. Sarah: That's a good point. I think when there's someone, even if you have a well-meaning team of people who have diversity and inclusion as part of their mandate, if it's not a focus other priorities can take precedence. I think having someone dedicated to dealing specifically with the mandates and the issues and the progress that companies want to make, essentially putting your money where your mouth is, which is great. Michael: Absolutely. Right? No one's going to hire a lawyer that's doing it off the corner of their desk. Michael: This is a real job. If you look to the United States, not that I want to do that often, but if you look at the way they approach diversity and inclusion every organization has a Chief Diversity Officer who reports to the CEO. They have a team of people. This is a big focus for those organizations. We're getting there in Canada. We're starting to see, particularly some of the banks that are naming VP's to those roles, not as high up as we would like to see them but it's a start. This is an evolution. We've come a long way in the past 15 years that I've been doing this work professionally and will continue to see that change. Sarah: It's interesting talking about changes that law firms have been making. I know CCDI did a fairly big research project specifically related to the legal profession, recently. I feel like a lot of our listeners will be fairly interested, specifically, in that initiative. Can you tell us a little bit about this? Michael: Yeah. We call it Diversity by the Numbers - The Legal Profession. It is a multi-year longitudinal study of the demographics of law firms, particularly licencees, both lawyer and paralegal in private practice. We've been doing it now for 4 years. As part of it we release a report, a public report, that we've been doing for the past couple of years. Previous to that it was just private reports to the firms that participated. The public report doesn't call out any one specific firm but it highlights the themes that we have seen. The most recent one that was released and a few months ago and I should point out to your listeners that this is publicly available on our website at CCDI.ca. What it found was, probably won't be surprising, but that most law firms cultures are very hegemonic, masculine organizations. What I mean by that is they sort of fit into one bucket. That they are predominately good cultures for straight, white able-bodied men, particularly those with stay at spouses. Not surprisingly, from the results we found that people who don't fit into that mould, particularly women and people who are racialized, either have to make significant sacrifices in their lives in order to fit in, in order to succeed, that the expectations on those people are higher or if they don't stay in the firm they will actually tend to go into private practice on their own. Single shingle type operations. They go in-house to different organizations, general counsel offices, as well as things like the attorney general's offices. Or they just leave the profession altogether in higher numbers than the dominant group of straight, white, able-bodied men. Michael: Our listeners include law firms and law firm professionals who want to do better. What advice do you have based on this report? Michael: Throw the model out. How's that? Start over. Yeah, you know, I think the reality is you are going to have to really examine the way you function as businesses. I'm not talking about how you build a client. You should definitely re-examine that but that's not what I'm talking about. I'm talking about things like how you do define success. Well, in a law firm you define success by making partner. Well, not everybody actually wants to make partner. I realize that's hard for some people to believe but that's because of the way you define what a partner is. If a partner means that you have to sacrifice your personal life and if making partner means you have to prioritize work over family then you're absolutely going to lose out. I think there needs to be a reconsideration of what success looks like. You need to find ways to make sure you are not watching talent walk out the door. Whether it's racialized people or women or anybody for that matter. I'll give you an example. So exclusionary social events. Social events, and this is just not law firms, I've seen this all over Bay Street, but they tend to be things like going golfing or drink ups. Well, there's a whole lot of people, I know this is going to be hard for some of your listeners to believe, who don't like golf. So going to a golf game is a fate worse than death. There's also people who don't drink. Muslim people, as an example, that are being encouraged to come out to social events where there's alcohol. Or encouraged to come out to events on a Friday which is a significant day in the Muslim faith. Those are things that exclude people. Or, say, lunch meetings during Ramadan. Where a firm is not recognizing that they have participants that are fasting and not to schedule lunch meetings during Ramadan. It's things like that where you need to change your behaviour in order for it to be inclusive of everyone as opposed to what works for you as an individual. Young mothers at breakfast meetings. Young parents at breakfast meetings. Where they're dealing with child care. You know, you could start the meeting after 9:00, not a problem. It's just a matter of making those simple adjustments in order to create a more inclusive environment for all people. Sarah: I think creating an environment where those conversations can happen because I think sometimes people in decision making positions maybe haven't turned their mind to, and I'm speaking very generally, but sometimes your mind's not turned to that so you go with the same events, or the same structure, that's the way it's been running for years and years and years. One of the things that Gowling has sort of, there's a women's forum, essentially, and that periodically there's a lunch where more senior female lawyers meet with younger female associates and we just talk about various issues that are facing women in the legal profession and in private practice. One of the things I think that actually been very beneficial about it is opening up the door to have those conversations so you feel more comfortable saying, "Well, maybe we can push a meeting post 9." because you're creating an environment where speaking out and saying those things is fine. Right? I think that's changing, you know, meeting times, making social events more inclusive but also creating an environment where people feel comfortable to talk about that and talk about the change. Michael: Yeah. Absolutely. It's moving beyond treating everyone the same to treating everyone how they need to be treated. Michael: There's always going to be a circumstance. That isn't to say that things can't be worked around but if the partner in charge really likes golf and decides that, "Oh, we're going to do a golf event." they're making a slew of assumptions about the people that they work with, not to mention their clients. But it's also a bit of a default. Like, why couldn't we try something else? Michael: There are lots of interesting ways to do social events. You just have to think outside the box. Go outside of your default and create that culture where it's okay for someone to say, "Actually, I have child care responsibilities. Can we push that meeting to after 9?" 9 times out of 10 the persons can say, "Oh, absolutely." But it's also about creating the culture where you've given the person the permission to make that statement as opposed to wondering what's going to happen. Because of course people might think it's a CLM. It's a career limiting move to say, "I'm sorry. I can't. At 3:00 I have to leave the office because I have to go pick up my kid but I'll be back online by 4:30." If people are afraid to do that then they're not going to do that. Whereas if the boss finds out, or the boss knows you have a kid, and has said to you, "Okay. What do you need to make sure that you can continue to do your job successfully and manage your child care?" The boss has then created that space where the person can say, "Oh. Thank you for asking. If it's okay I'll leave at 3:00 but I'll be back up online by 4:30." Or whatever the times are. It's simple things like that. This is simple stuff. But it's change and change is never easy. Roberto: Well, it's interesting too because I think you spoke about a couple of things. One being the structure, sort of the partnership structure which is the standard law firm set-up, but also the implementation of how we do meetings and how we do business development events. As somebody who has, you know I started as summer student 2009 with this firm, and have sort of grown up with it. I spend a lot of time talking about diversity inclusion, learning about diversity inclusion, training people on diversity inclusion, but as I've got more senior, as I've move further on down the organization, I've got to try incredibly hard to stay engaged. To try to make sure that people are still, we're still able to engage in those conversations. The structure as it is, certainly you create some separation as you become more senior, even if it's not on purpose. It's certainly an interesting challenge and an interesting discussion that I think I continue to struggle with because I certainly want to be approachable. I want to have these discussions. I think we do a pretty good job but I'm also sure I don't know what I don't know. I'm sure I'm missing quite a few things along the way as well. Michael: That's exactly it. You become a partner and you become part of the elite. You become an owner and that changes things but you may not have any awareness of that. The other thing I would say is that the concept of law firms was created hundreds of years ago. The reality is that not a lot has changed in the way law firms function since their creation. It's going to take, I think, some pretty progressive law firms, Gowling is one that could be that progressive, to change things in a very deliberate way. For example, a company announcement in advance of, I'm going to use it again, in advance of Ramadan to say, "Please do not schedule lunch meetings, or meetings involving any meals, during Ramadan. Please understand that our Muslim colleagues will need to be leaving the office prior to sundown." Now, that's not a problem when Ramadan falls in July. It is a problem when Ramadan falls in September. That's the sort of simple thing that recognizes the difference. Recognizes that people need to be treated how they need to be treated. It can have a significant impact on how engaged people are in their work with the organization. Sarah: Definitely. That's a really good point. Roberto: This has been a pretty great discussion. But I think we're going to run onto the ending here. Oh my goodness. This has been really great and giving us a lot to think about, Michael. That's for sure. Sarah: We want to thank you very much for being here with us today. Again, it's been a fantastic discussion and I hope we have many more opportunities to keep this discussion going at a later date. Michael: Absolutely. Thank you so much for having me. It's been a pleasure. Roberto: For our listeners, if you ever have any questions, comments or ideas for topics and guests please look us up at gowlingwlg.com and get in touch with us. We'd love to hear from you. And also make sure to check out the show notes at diversonomics.com. Sarah: Last, but not least, make sure to subscribe on iTunes so you don't ever miss an episode. And while you're at it leave us a review to let us know what you think. Roberto: You can also follow me on Twitter at @robaburto and Michael do you have anything to plug? Michael: Oh, you can follow me on Twitter at @diversity_dude. Sarah: That is an amazing Twitter handle. That's fantastic. Michael: I just like saying the word "dude" because I'm so not a person who should say the word "dude". Sarah: Thanks again. Diversonomics is presented to you by Gowling WLG. Roberto: Special thanks to our producer, Rachael Reid, and our sound engineer, Josh Bowman. This podcast will count for up to 26 minutes of Equality & Inclusion Professionalism (EDI) credit toward the mandatory CPD requirements of the Law Society of Ontario (subject to the overall limit of 6 hours per year for viewing archived video programs). Roberto Aburto is a partner in Gowling WLG's Ottawa office, practising in municipal law and civil litigation, with a focus on real estate disputes, land use planning law and commercial litigation. He is also an active member in the swimming and lifesaving community, serving on the board of directors for the Lifesaving Society (Ontario Branch) as the corporate secretary/legal adviser, and on the Lifesaving Society (National Branch) National Team Selection Committee for Lifesaving Sport. He is also co-chair of Gowling WLG's Diversity and Inclusion Council and is committed to promoting these principles. To learn more about Roberto, view his bio or connect with him on Twitter or LinkedIn. Sarah Willis is an associate in Gowling WLG's Ottawa office, practising in the areas of commercial and civil litigation, and medical defence law. To learn more about Sarah, connect with her on LinkedIn.